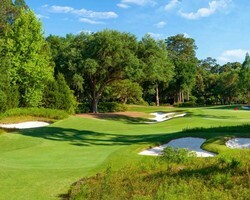 Caledonia Golf and Fish Club | GolfTrip.com - Golf Tips, Vacations, Packages, Destinations and more! Possessing an incredible design and natural beauty, the Caledonia Golf and Fish Club sits within the working southern rice plantation in Myrtle Beach, South Carolina. Caledonia was opened in 1995 and since then, this golf vacation destination has been serving local and international clients well. Ranked as fifth Best New Public Course by Golf Digest, this resort is lined with centuries old oak trees allowing visitors to feel closer to nature. Aside from that, this club is also ranked in the Top 100 You Can Play in 2000 by Golf Magazine. Taking into account all these rankings, Caledonia provides the perfect golf experience for players of different levels. The Caledonia Golf and Fish Club harbors an antebellum-style clubhouse which offers various amenities to their valued guests. Practice facilities are also available to aid beginners in practicing their shots. PGA professionals assist golfers with regards to the course information such as yardages, elevation changes, and other features to help them have a perfect golf trip to remember. White sand bunkers, water hazards, and other hindrances make this course a challenge even for the finest golfer. Different sets of tees allow players to choose the round which is appropriate for their skills. Ranked within the Top 100 America’s Greatest Public Courses by Golf Digest in 2005 to 2006, the Caledonia Golf and Fish Club continues to live up to the credit given. Golf vacation packages offered to new and regular visitors help golfers save a lot of money on their accommodations and other fees. Discounts can also be availed through the packages posted on their website.